In my first column discussing heart attacks, I described their risks, symptoms and the necessity of rapid treatment. It is important to know that when a heart attack strikes, time equals muscle. The longer the delay in seeking medical care, the more heart muscle will be damaged. In this article, I’d like to talk about what happens to a person after suffering a nonfatal heart attack. Upon arrival to the emergency room, a patient is immediately placed on a cardiac monitor to measure heart rhythm. Vital signs are taken, with blood pressure and pulse being of primary importance. Oxygen is administered, and an aspirin tablet is given. An EKG (electrocardiogram) is done, verifying heart rhythm, rate and possible damage, and blood is drawn and sent to the laboratory. An IV will be started to allow for the immediate injection of any necessary drugs. Both the EKG and blood tests may be repeated to check for changes. When the diagnosis is confirmed and when the patient is in stable condition, he or she may immediately undergo coronary angiography — a special X-ray of the heart and blood vessels that can identify the location of blockages in the coronary arteries. This exam is performed by a medical specialist who passes a thin, flexible tube called a catheter through an artery in either an arm or the groin. A dye is injected through the catheter, and as it passes through the coronary arteries it is seen on the X-ray and helps identify the blockage. With the blockage located, the doctor can then open the blockage via angioplasty (a technique that inflates a balloon inside the blood vessel) and restore the blood flow. Sometimes, a small mesh tube called a stent can be placed in an attempt to keep the blockage open. In some smaller communities where angioplasty is not available, another method of opening arteries is by prescribing medication called a thrombolytic, commonly called a “clot buster,” which can help to dissolve a clot. The sooner after a heart attack this is done, the better, as it increases survival rates and decreases the chance of damage to the heart. In some cases, doctors may perform emergency bypass surgery at the time of a heart attack, especially if multiple blockages are identified. This procedure involves sewing another blood vessel from your own body to bypass the blocked coronary artery, restoring blood flow to the heart. This surgery, as well as the above-mentioned angioplasty, is available in our community. Most people can return to work and the activities they enjoy after having a heart attack. Exercise especially has many benefits for people after a heart attack. It can strengthen the heart muscle as well as make one feel more energetic. The amount of activity you can do depends on the condition of your heart. Your doctor can help you plan the necessary steps for your recovery. A heart attack happens when blood flow to a section of the heart is blocked. This deprives the heart muscle of oxygen and can cause that section of the muscle to die. Heart attacks are the leading cause of adult deaths in the U.S., causing more than 1 million deaths each year. Today, thanks to better awareness on the part of the public and improved treatment, most people who have a heart attack survive. But treatment needs to begin within one hour of the first sign of symptoms. So, if you or someone you know might be having a heart attack, call 9-1-1 immediately to be transported to the nearest hospital emergency room. What causes the attack? The coronary arteries are the blood vessels that bring oxygen-rich blood to the heart muscle. Over time, one or more of these arteries can narrow due to a build-up of cholesterol along the arterial walls — known as plaque. When plaque ruptures in an artery, a blood clot can form and block the flow of blood. This is what usually causes a heart attack. The severe consequences of a heart attack include heart failure and life-threatening arrhythmia (irregular heartbeat). 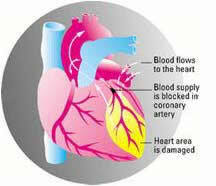 Heart failure is when the heart muscles are too damaged and weak to adequately pump blood through our bodies. This condition usually takes its toll sometime after the heart attack. But the most common threat to life is an arrhythmia called ventricular fibrillation, which causes the heart to beat so irregularly that it cannot pump blood at all. When someone dies immediately of a heart attack (cardiac arrest), it is usually from ventricular fibrillation. If a person in ventricular fibrillation is given an electrical shock with a defibrillator within the first 5 or 6 minutes after cardiac arrest, a normal rhythm can occasionally be restored. This is why timely emergency response is critical to surviving cardiac arrest. Most of our communities have fire department EMTs and paramedics who will usually respond first to a 9-1-1 call and are trained to begin potential life-saving treatment. Chest pain usually described as a pressure sensation in the middle of the chest, which may be mild or severe. This pain is often mistaken as heartburn or indigestion. The pain can radiate to the jaw, neck or arm, usually on the left side. Nausea, lightheadedness and/or breaking into a cold sweat. Don’t “tough out” the symptoms of a heart attack. Within minutes of experiencing heart attack symptoms, you should call 9-1-1. Having trained paramedics attend to a victim as soon as possible gives the victim the best shot at survival. If there is no access to emergency medical services, which is rare in our communities, have someone drive you immediately to a hospital emergency room, and preferably not to your doctor’s office, clinic or urgent care center. Try not to drive yourself, as you might put yourself or others in danger if your condition worsens. Limiting risk factors and understanding the symptoms of a heart attack and seeking timely emergency medical care will go a long way in helping people survive heart attacks and live full, active lives.